What was once treasured as a precious gemstone for only people of noble and bourgeois birth, new prospects increased the supply of diamonds throughout the nineteenth century, which opened mass-market availability and consumption. These new prospects were in fact directly related to the dispossession of Indigenous peoples in the African colonies, and then later in another British colony closer to home, Canada. The continued growth of the global capitalist economy, and with the support of ‘successful’, emotionally driven advertising campaigns, the consumer consciousness and the desire for recognition in diamond engagement rings increased across the world. The DeBeers love story, “Diamonds are Forever”, engagement ring symbolized everlasting love, and represented the lasting bond and commitment between two people. 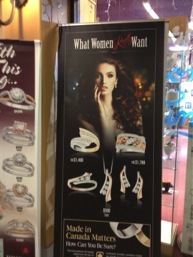 This advertising campaign created new markets in countries, such as Canada and the United States, where there was NO previous ‘tradition’ of diamond engagement rings. Furthermore, this story is rooted in an external recognition of the love we have in our relationships, and continues to support a heteronormative and heteropatriarchal perceptions of romantic relationships. “Men are convinced that their love for their future wife is directly proportional to the expense of the diamond ring, [which] also convinces women to expect love [and security] in the form of a shiny stone” (Moosa 2013). I can attest to that. 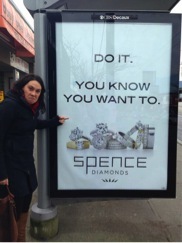 Working at Spence Diamonds, I had men running into the store asking me if they needed to save three months salary to buy a meaningful ring for their true love. Think about it. Where did they hear that story? Advertising. But don’t worry. Capitalism has a sliding scale for love based on personal salary. How noble. Let’s start by looking more closely at the initial discovery of diamonds, and then at the “ethical” Canadian diamond. Diamonds were discovered in the mid 1800s in the Cape Colony, which is now South Africa. As colonial governments were “relinquishing” control over the colonized, their capitalist offspring, the new wave of resource extraction corporations, took their place, conveniently in a space of confusion and vulnerability. Cecil Rhodes founded DeBeers to take control over the diamond exploration in South Africa. He was an English businessman and opportunist, and happened to be a colonialist and colonizer, or the British History 101 version, a politician of South Africa during the same time as his business ventures. He has been historically acknowledged for his integral role in southern African and British imperial history (Woodhouse). But what does that mean for the nations of that land? Diamond mining further dispossesses nations from the land: our northern relatives, the Gwich’in, the Dene, the Inuit, and northern Nehiyaw nations, and our animal nations which includes the caribou, wolverine, bear, ptarmigan, and fish nations. Expediency for extraction creates inadequate regulatory frameworks at the municipal, territorial, federal level, and contentiously negotiated self-government and impact benefit agreements, in addition to pipeline pressures. Furthermore, these mines mean cultural and social disruption for the local nations, with few financial LONGTERM benefits. Ekati, Diavik, Jericho, and Victor (the diamond mine next to Attawapiskat) are all diamond mines in Canada that have caused a disruption in the social fabric in these communities, affecting relationships from the collective level to the very intimate and personal. Ellen Bielaski, a past dean of the Faculty of Native Studies and author of Rogue Diamonds, through her experience with the Dene people, found “no tradition of digging into the ground for diamonds,… [rather] diamonds became the stuff of hierarchy and ornament, while the Dene lived as nomadic hunters in a land that required travelling light and moving often” (2003, 24). Furthermore, through her research, she declared that “diamonds and other minerals fuelled the founding of apartheid” (2003, 25). The diamond as a love story is an imperial, colonial, and capitalist love story. Colonial governments work with capitalist/neoliberal projects, such as the diamond extraction industry, and use advertising to create narratives of consumer demand to justify production, which ultimately means further land dispossession of Indigenous peoples. So, when we think of how the diamond ring can be integrated into our cultures, let’s think of how wearing a diamond ring affects all our relationships with our relatives. Ask yourself what’s the purchase of recognition in the diamond? Why? Why do you really want to do it? I’m optimistic about reconnecting with our love stories. The next part gets better. Bielawski, Ellen. Rogue Diamonds: The Rush for Northern Riches on Dene Land. Vancouver: Douglas and McIntyre, 2003. Hardt and Negri. Multitude: War and Democracy in the Age of Empire. New York: Penguin Press, 2005. Moosa, Tauriq. “A man’s perspective on why engagement rings are a joke.” The Guardian November 2, 2013. Accessed February 2, 2014. http://www.theguardian.com/commentisfree/2013/nov/02/dont-buy-an-engagement-ring.